Summer will be wrapping up in less than a month and I’m already starting to think about all things fall! Yes, that includes pumpkin everything! I created this easy kid-friendly treat perfect for fall out of Oreo cookies, Wilton candy melts and jujubes. It’s so simple to make and something your kids can get involved in making. I find melting the candy melts the easiest in the microwave. Just be careful to not overcook them because it will seize. I stir in between and once it’s close to being melted you can sometimes stir until it’s smooth. If you don’t want to use Oreos, substitute another cookie. Just make sure it’s round so it looks like a pumpkin when you are done! 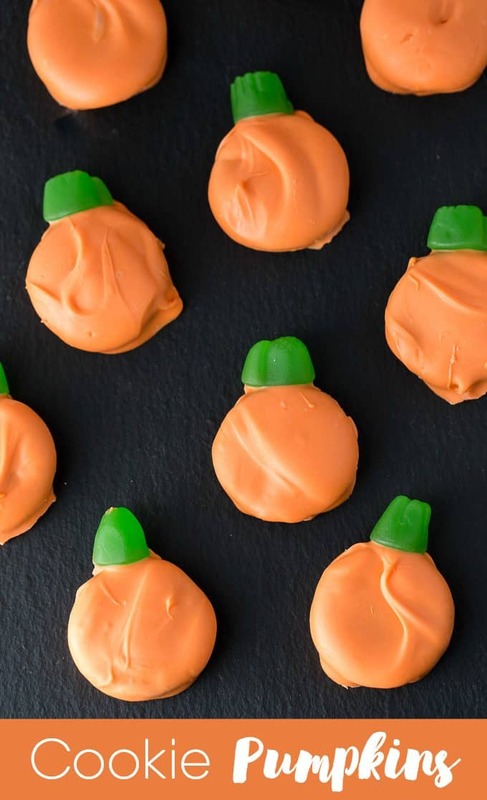 An easy fall treat you can make with your kids. Add orange candy melts to a microwaveable bowl. Cook for 1 minute in the microwave at 50% power. Stir. Continue to cook at 30 second intervals (50% power), stirring in between, until candy melts are melted. Dip Oreos in the melted mixture to completely cover. Use a spoon to hold the Oreo when you dip it in so it’s easier to maneuver. Place Oreo on a piece of parchment paper and quickly add a jujube to the outside edge for your pumpkin stem. Let cookies sit at room temperature until hardened (about an hour). Fun idea for the Halloween/Fall Season! Thanks for sharing! These look so great! and who doesn’t love Oreo’s!? These are so cute and easy! They’d be great as jack-o’-lanterns too. 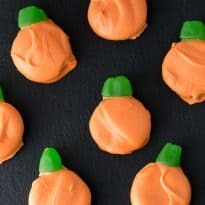 These are so easy to make and I always make some Halloween Cookies before the big day. I think I am going to make these this year!! Thanks these are cool and will be a nice addition to our Halloween party this year. Love how easy! Thanks for sharing at this week’s Inspiration Spotlight party. See you again soon. Pinned & shared. Your Cookie Pumpkins look so cute and delicious. Thanks so much for sharing with us at Full Plate Thursday and have a great weekend! These cookies are very cute…thanks for the recipe! These are so cute, but simple! I can’t wait to make these with the kids! Thanks for sharing these at the #SmallVictoriesSundayLinkup! Awesome, Stacie! Anyone can make these simple and quick!! Thank you for sharing at DI & DI 🙂 We enjoy your creativity each week! These are really cute for Halloween. I just might make some of these. Thanks for sharing. These sound so easy to make! The kids will love them! !